“I’m so sorry.” The host is profusely apologetic when we arrive for a 7:30 reservation at Candela Tapas Lounge and the table isn’t free. It should be a sleepy Tuesday night in Hanover, N.H., but Candela is packed and boisterous. Though we don’t care a whit, the host generously offers us free drinks — a mojito, maybe? Some sipping rum? Then he stewards us to two seats at the long counter in the window, where, despite the crush, he reports back to us every few minutes. Turns out that our host is Candela owner James Van Kirk. His booming, warm hospitality springs in part from his upbringing in Puerto Rico. Having to turn away walk-ins on a Tuesday night — as Candela has almost every night since it opened in mid-June — is a good problem to have. Even so, Van Kirk seems to fret over all of his guests as if they were friends, which helps foster the vibe of an ongoing party. When a group of Dartmouth College students has to wait for a table, as well, Van Kirk appears before them on the patio with a platter of complimentary apps. Soon the students are holding an impromptu salsa party, clapping and dancing as other diners turn their heads to watch. 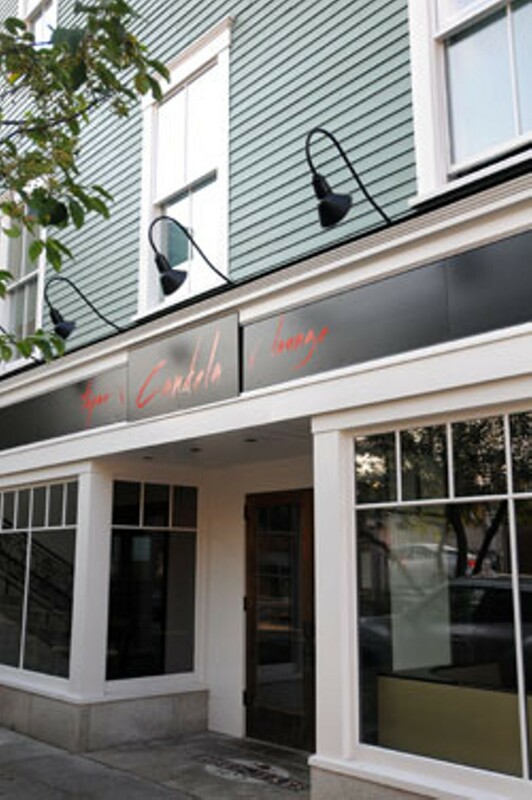 Candela isn’t Van Kirk’s first restaurant run; in 2011, he partnered with a fellow Puerto Rican, chef David Diaz, to open a Caribbean restaurant named Melaza that brought arepas, yucca and ropa vieja to sedate Woodstock. Last winter, Van Kirk sold his interest in that restaurant and set his sights on Hanover, where he took over the partially subterranean Lebanon Street space that used to house Rosey’s Coffee & Tea. After he installed a bar up front and an open kitchen in the back, Van Kirk painted the walls dark red and squeezed 50 seats into the elongated room. At Candela, Van Kirk tapped chef Todd Raymond to create what the latter calls “Caribbean tapas,” drawing on the hodgepodge of culinary influences on that region — French, African, South American and Portuguese. Raymond, the longtime chef at local mainstay Jesse’s, came within days of opening his own spot in Windsor last winter, the Redhead Bistro, but he shelved his plans to join Candela’s team. Raymond’s menu is playful in its combinations, and the European touches are ample. He loads ropa vieja flank steak into crunchy plantain cups, for instance, but employs a more delicate leek beurre blanc (as well as a membrillo-balsamic reduction) on his ham-wrapped scallops. None of these small plates cost more than $13, and many would please foodies who still lament the closure of Stowe’s Santos Cocina Latina and Montpelier’s Black Door Bar & Bistro. Raymond traverses Caribbean and Spanish cuisine artfully. Booze is a big presence at Candela, from the minty, sweet mojito — one of the bar’s signatures — to the tequila that the chef splashes into his ceviche. If you’re a fan of the Cuban rum-and-Coke concoction called Cuba Libre, you can get one here. And if you obsess over aged sipping rums — such as a silky 23-year-old Zacapa from Guatemala — Candela’s bar can oblige. All of the six wines offered by the glass are available in flights, too — one white, one red — which, like tapas, encourage experimentation. Oenophiles, beware: The three wines in each flight come in short glasses, so don’t try swirling your Godello or Grenache. I had a splash of Monastrell in my hand when our first dish arrived: a trio of elongated, crumb-coated orbs of fried paella, a clever take on risotto balls. Their skins provided a delicate little crunch on the first bite, and their insides were dense bites of herb-spiked rice. We thought we saw the students — by now seated at the communal table near the front — order some to accompany the juicy, cloudy house red sangria that’s offered by the pitcher. A sip of Albariño was the better companion for Candela’s montadito, the tiny, open-faced sandwiches common to most Spanish tapas menus. Picture a smear of tangy tomato confit on top of crusty bread, anointed with a cross of pristine white anchovies and a kiss of lemon oil — a briny, crunchy, rustic blend of sea and soil. By now we had observed that most of Candela’s tapas options come in trios, which worked well for the young couples around us flirtatiously clicking forks on the last bite, but can be awkward for larger even-numbered parties. 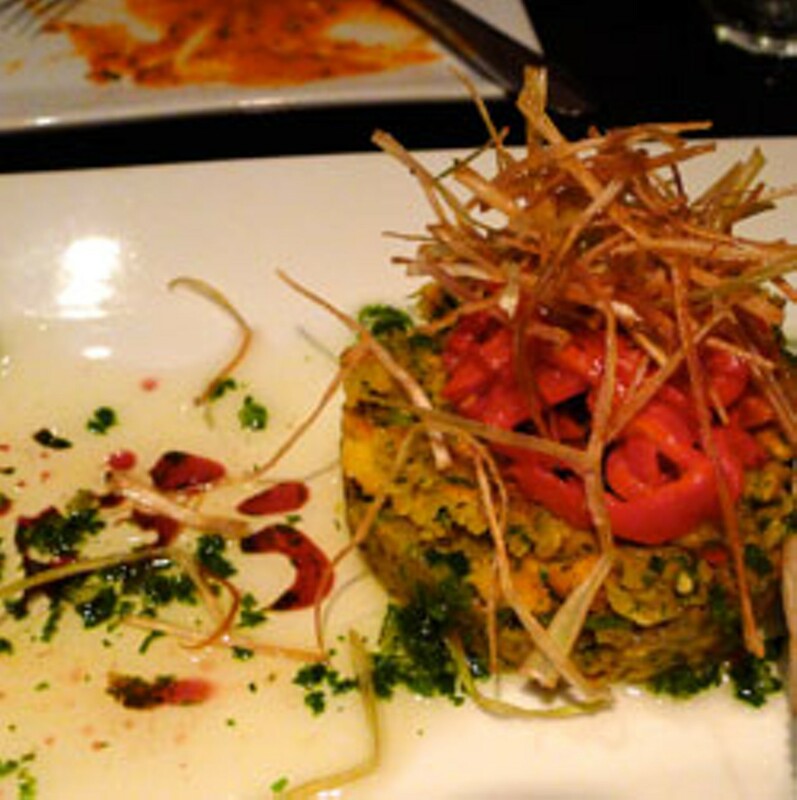 An acquaintance who had already dined at Candela had given us advance warning. We had no such problem with the ceviche, however, a glimmering tangle of diced scallops and shrimp that came with a basket of crispy, curled plantain chips. Lounging in a puddle of what tasted like mango purée — its tequila barely detectable — the dish resembled a pastel watercolor, but it was also fruitier, sweeter and more liquid than most of the ceviches I’ve tried. Sometime between the removal of the empty ceviche bowl and the arrival of our Albóndigas à la Carmen, the party of three beside us paid their bill. Before they departed, one of them — a distinguished-looking guy in his fifties — practically swooned as he told his server that theirs was “the best meal he’s ever had in Hanover. And she’s from New York!” he added, pointing to the older woman next to him. We pondered this testimonial for a second before digging into our ramekin of tender, herb-spiked pork meatballs slathered in a smoky-sweet romesco sauce. The Valdeón blue-cheese foam that pooled to one side was so softened by the peppers that it almost tasted like yogurt, lending the dish a Middle Eastern tinge. I dragged charred crostini through every last drop of the sauce. Instead, we went for the churrasco skirt steak. Once unwound from the tight, skewered spiral, the meat gave off the smoke and char it had picked up from the grill; it practically sang an aria under its veil of summerlike chimichurri. The garlicky yucca mofongo that shared the plate was a deeply flavorful alternative to mashed potatoes. Altogether, it was our favorite dish of the night. Savory dish, that is. The churros here are deadly and impossible to resist. The hot, doughy snakes were softer than the usual churro and more exuberantly coated in sugar and cinnamon, and they were positively button popping when dipped in the molten dark-chocolate sauce that comes on the side. Hanover is a deceptive place; placid and whitewashed on its face, it’s home to brilliant people from all over the world. That diverse population may help explain Candela’s quick success. Soon Raymond will change up the menu to make room for a few more autumnal flavors. He’ll also include new twists on seafood — a spicy tuna tartare with avocado butter, for instance, and ahi tuna tostones. Sounds like the party will keep going for a while. Candela Tapas Lounge, 15 Lebanon Street, Hanover, N.H. Dinner Tuesday through Sunday. Info, 603-277-9094. The original print version of this article was headlined "Caribbean Nights."